This is the beginning of my version of Evelyn Clark’s “Swallowtail“. It is in “Georgia O’Keefe” colorway of Madelinetosh yarn given to me by SeedlessGrape. I like the yarn a lot. I also think it is perfect for this application. The results are beautiful in person. The picture is really mediocre, being a phonecam shot. There is some disconnect about the name for this project. 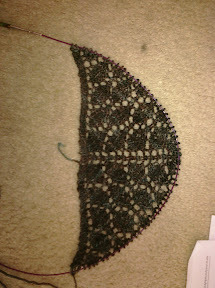 I love the idea of having a black lace shawl that I could give to someone who is newly bereaved. However, that would mean a single use for an item that will likely take me a person-year to finish. Plus most people wear black for formal and dressy events. So that would be a much better value for the time. I think the first section’s medallions look like turtles. They also look like leaves. If I went with the funeralistic idea, I would call this “it’s turtles all the way down”. Because that is reminiscent both of the way grief pours out your soul and fills you up with pain until it runs over and drips down as tears. And also of the mythology that the Earth is flat and rests on the back of a turtle. When someone asks what the turtle rests on, the answer was, “It’s turtles all the way down.” Which suggests to me that even if your bedrock is shaky, there is something under it; and if under that is shaky, there is still more. So I am very attached to the name of the project, but I think the concept is ill-suited to the result I would prefer. I would, perhaps, consider renaming based on something of O’Keefe’s art, but I have absolutely no clue why the M’Tosh people called it that. It is not reminiscent of O’Keefe’s work from my experience. I cannot think of a single instance where the majority of the work is black. To me, the colorway should have been “Early Spring, after the forest fire.” There are strong hints of earthy green in the black field. This and the leaf patterning of the stitch motif keeps me from naming it for a sky thing. Perhaps this project will await its name after completion.